Plant Characteristics: Annual, simple or several-stemmed, erect or prostrate, hairy, 0.5-5 dm. long, leafy throughout, the stems with readily exfoliating epidermis, in infl. glandular; basal lvs. forming a loose rosette, linear-lanceolate to oblanceolate, subentire, 1-8 cm. long, subsessile; cauline lvs. shorter, sessile, denticulate, crisped; fls. 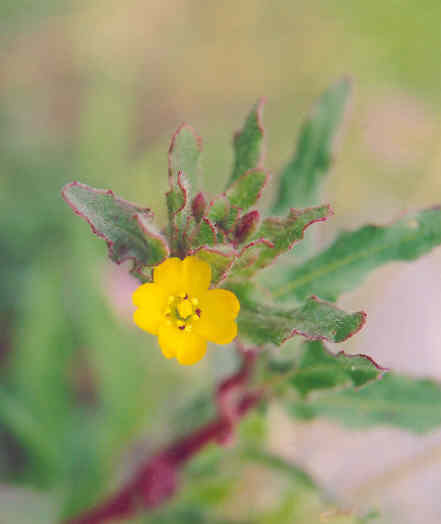 small; petals yellow with 1-2 red dots at bases, lasting less than one day, often drying green or reddish, 2-4 mm. long; sepals 1.7-3.5 mm. ; stamens 8, unequal; caps. curved or contorted, quadrangular, 1.2-2 cm. long, 1.8-2.2 mm. wide, gradually attenuate to apex, usually beaked; seeds dull brownish black, obovoid, 1 mm. long, finely cellular-pitted. Habitat: Common in dry disturbed places, burns, etc., below 3000 ft.; Coastal Strand, Coastal Sage Scrub, Chaparral, etc. ; mostly near the coast from Marin Co. to L. Calif., Channel ids. March-May. Name: Camissonia, named in honor of Adelbert Ludwig von Chamisso ( 1781-1838), who named the California poppy. He was the botanist on the ship Rurik that visited California in 1816. Lewisii, in honor of Captain Merriweather Lewis (1774-1809). Leader with William Clark in the famous Lewis and Clark Expedition across the continent 1804-1806. (Jaeger 312). General: Occasional in the study area, having been found on Shellmaker Id., the bluffs northerly of 23rd St. and North Star beach. Photographed on Shellmaker Island. Flowers open in the A.M. (my comments). In April 1996, the Fish & Game created three sand dunes behind their trailer and around the amphitheater. In the fall of 1996 I seeded the dune nearest the amphitheater with several species but not C. lewisii. 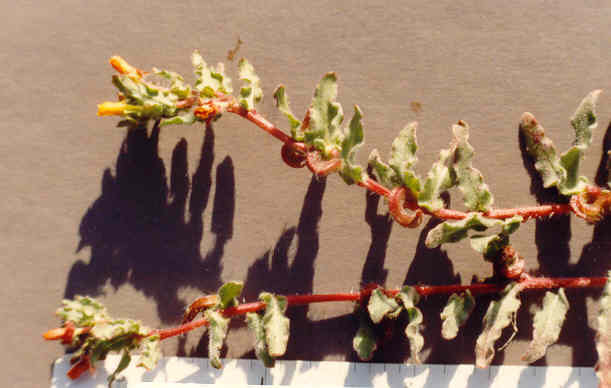 In the spring of 1997 there were a large number of C. lewisii plants on the dune, the seed having been blown in by the winds of the winter; no other non-seeded species was as prevalent. (my comments). About 200 spp. of Oenothera of the New World, mostly of temp. regions. (Munz, Calif. Flora 944). Rare. O. micrantha misapplied. Self pollinated. Related to C. bistorta. (Hickman, Ed. 783). 62 species in western North America, 1 in South America. (Hickman, Ed. 778). Text Ref: Abrams Vol. III 202; Hickman, Ed. 783; Munz, Calif. Flora 955; Munz, Flora So. Calif. 598. Photo Ref: Mar-April 88 # 10A,17A,18A; Mar 03 #16. Identity: by R. De Ruff, confirmed by F. Roberts. Computer Ref: Plant Data 363.